Today Dad shares memories of the Navy and rum. Every morning at 11am came the long awaited pipe over the tannoy of “Up Spirits” when as far as possible every member of the mess contrived to be present when one man was detailed to take over the ubiquitous galvanised bucket and dash along the part of the ship where an officer was supervising the rum issue. The exact number of tots to equate with the number of men in the mess who were entitled i.e. 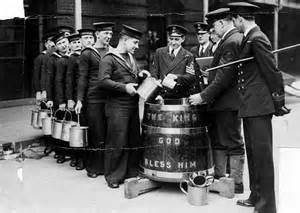 over 20 years of age was measured into the bucket and the collector “the rum bosun) hurried back. Back at the mess the rum tots were carefully measured out under the supervision of the Leading Hand of the mess to each man entitled. The process was watched with a keen eye by every recipient to make sure that it was measured meticulously. During that year there was an incident on HMS Ajax where twin sailors had a 21st birthday and consumed so much rum that both died. This resulted in a signal from the Admiral reinforcing the rule of no sharing and not storage of rum which was obeyed for a short while. There was no other form of alcohol available to the lower deck as all crew who were not officers were known. Navy ships were dry ships but as ever there was an exception to this rule. Alcohol was available to officers. There was no limit to how much alcohol an officer consumed. This disparity between officers and men on the lower deck was accepted as part of life I did not come across any resentment about this. Inevitably after a run ashore, some members of the lower deck tried to bring alcohol back on board. It was not easy to get away with because for the most part returning on board involved a motor boat journey to the ship to the only boarding point which was by way of a Jacob’s ladder thus any bottle of booze stood in danger of falling out of a jumper into the sea. On reaching the boarding deck, one had to stand and salute in the presence of an Officer of the Watch, a Duty Petty Officer, a Master-at-Arms and sundry others who recorded each man’s name and handed him his Watch Card which was in effect his identity card. This system ensured that the ship knew when everyone was aboard and would also identify who, if any, were missing. With all this scrutiny (and there was a light to search) it would be near impossible to smuggle any booze on board. If caught the culprit was put straight in cells and subsequently punished. So much for alcohol or the absence thereof. The same applied to tobacco. Incidentally there is a sequel to the returning aboard system. Sometimes you bought things maybe a souvenir but if you could not carry it up the Jacob’s ladder you lost it to the motor boat’s crew. Drastically, if you were too drunk to climb the Jacob’s ladder (there were always two or three) you remained in the motor boat until all others had climbed and then the ship’s crew would be called into play and would lower a wire net into which the incapable seaman would be bundled, raised to the flight deck and conveyed straight to cells. Officers came aboard by the much more genteel fashion of climbing a gangway to the quarterdeck (at the rear of the ship). There was a strict separation between officers and men. Officers were quartered at the rear of the ship. The lower deck was forward. There was no access by a lower deck man to the quarterdeck.